One thing that I have learned during my 23 years of life, and 23 years as a single lady is that singleness looks different for everyone. Some thrive in it, some use it to serve others and for some it is a time to advance in their careers. And some struggle in it, dwell in it, and can't wait to get out of it. With all that said, I'm not really even sure what it looks like for myself right now. When I first started this blog I wrote a post titled Singleness and Happiness. That was in February and it is funny how my current 'singleness' looks so different from what it was then. In college, once again, my singleness looked completely different, and it was during college when I heard this beautiful sermon from Matt Cater at Austin Stone Church. Not only did I cling to, but I held onto those beautiful words that he spoke during that four part series. -Singleness offers you an undistracted, undivided, devotion unto the Lord. -Singleness offers a blessing that is eternally better than the earthly blessing of children. -Think about the day that you will die, when you open your eyes there is Jesus and you are face to face with the Love of you Life! What an amazing wedding day that is going to be! 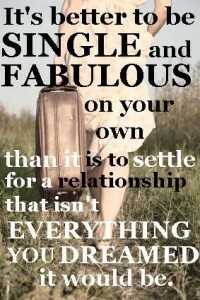 Singleness is a little bit of everything for me right now. It is a time that I am able to focus on my career and be a bit selfish and get a new car that would never qualify as a mom car. It is a time that I am discouraged some days and struggle in it. It is a time that I get to spend with my parents that I will never get again, at least in this context. However I spin it, however Hollywood portrays it, and however it seems in all the dating books out there; the truth is IT IS A GIFT FROM GOD. God has a different plan for each and everyone of us, and I hope that this post has been just as much of a reminder for you as it has been me! I have so many friends who are struggling with singleness right now... Even though I'm married, I can look back at that time, and see how God worked in HUGE ways in my life. So I hope that you're encouraged in that! I couldn't agree more with what that picture says!